gyroFIRE is a natural user interface platform and simulator for Google Glass and HUD-based wearables. 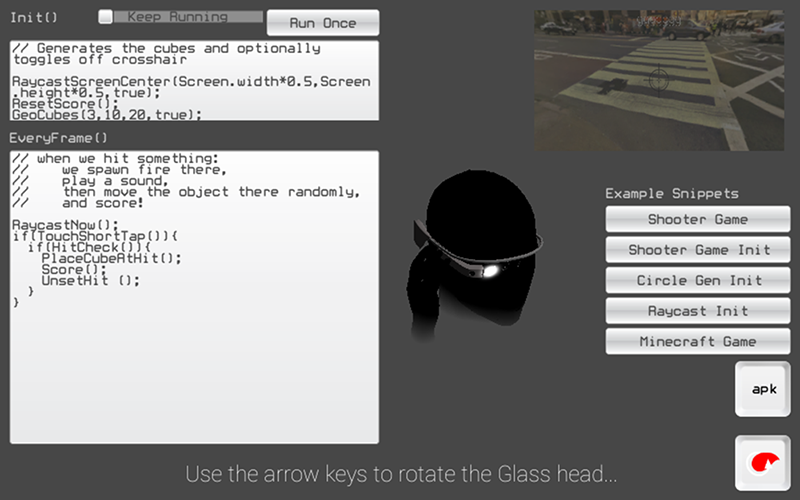 To expedite development, there is also a browser-based (WebGL coming soon) and cross-platform native IDE (based on MonoDevelop and Unity) that allows for 3D simulation of the wearables user experience. Sensor inputs can also be connected to the real device, so that the simulator becomes a remote interface used for testing wearable devices, effectively enabling a wearable device testing platform. Here are some examples of gyroFIRE platform apps showing some extensions of its versatility. Most example apps below also includes a browser try-out, that also works on any traditional device. Tap to shoot things (and people) around you. | Try it! gyroFIRE Create to Fire mode lets you create minecraft blocks all around you. | Try it! A gyroscope-variation to Flappy Birds. Minimalist edition here | Try it! Aim for what you want to load. | Try it! Play a classic drum set on your Glass. 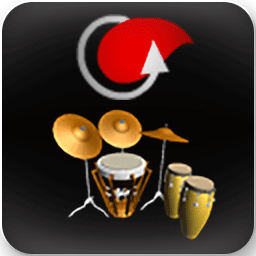 Aim with your eyes, then tap to play the the virtual drum set in front of you. | Try It! Play a cylindrical piano all around you. Aim with your eyes, then tap to play the corresponding piano key. | Try it! Sculpt a clay ball with your eye. | Try it! Look around, then aim with your eye to access the camera from local Wunderground webcams. gyroFIRE is a natural user interface platform for Google Glass and HUD-based wearables. A high level framework fosters rapid application development, utilizing native device features, such as onboard device sensors. The system also include a joint-emulation virtual simulator for device testing and interaction. A variety of sample games and apps have been created using this platform, and each can also be demo’d on a non-Glass device using the joint-emulation virtual simulator. StatusBeta is a wearable devices testing platform, extended from the gyroFIRE framework. Unlike traditional device testing platforms, it features a 3D device virtual emulator, that can be connected to send and receive both the wireless and physical state of the real device, on a customized joint emulation rack.